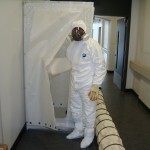 PPE with RPE in use on a mould remediation job. After many attempts at fitting this course in among my commitments, I finally did it!! November 1st, 2nd and 3rd 2016. This was a two day course on RPE Essentials followed by a one day introductory course on Fit Testing at Health and Safety Laboratories in Buxton in Deryshire. These courses gave me a much better understanding of the different types of RPE there are and the legal issues in providing the correct RPE to employees and making sure that it fits correctly. I will almost certainly be signing up with HSL for the next PPE course they run.